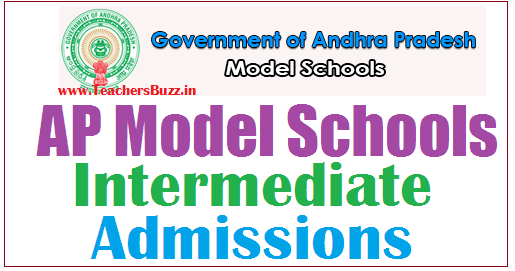 AP Model Schools Inter Admissions 2019 , #AP Model School #Inter first year #admissions, Inter first year admissions are started in Andhra Pradesh Model schools, AP State Model School Inter Admission Notification 2019 . APMS|AP Model School Intermediate 1st Year Admissions Notification 2019, AP Model School Inter first year admissions.The C&DSE(Commissioner and Director of School Education) has issued the AP Model School Inter first year Admissions 2019 Notification in the moth of March 2019 for admission into Intermediate1st year Bi.PC, MPC, CEC, MEC Groups Admissions for the academic year 2019-20, so all the eligible candidates can apply for AP Model Schools inter first year 2019-20 online applications from http://apms.cgg.gov.in/ and http://www.cse.ap.gov.in/ websites. ★ రాష్ట్రంలోని ఆదర్శ పాఠశాలల్లో ప్రథమ ఇంటర్‌ ప్రవేశాలకు విద్యార్థుల నుంచి దరఖాస్తులు ఆహ్వానం . ★ సదరు విద్యార్థులు ముందుగా ప్రవేశ అనుమతి కోసం దరఖాస్తు చేసుకుంటే ఫలితాలు వచ్చాక మార్కులు లేదా జీపీఏ పత్రాలను అందజేయాల్సి ఉంటుంది. ★ రాష్ట్రంలో 164 వరకు ఏపీ ఆదర్శ పాఠశాలలు ఉన్నాయి. ★ ఒక్కో బడిలో ఎంపీసీ, బైపీసీ, సీఈసీ, ఎంఈసీ గ్రూపులకు సంబంధించి ఒక్కో గ్రూపునకు 20 మంది విద్యార్థులను చేర్చుకుంటారు. ★ ఏప్రిల్‌ 30వ తేదీలోపు తమ దరఖాస్తులు ఆన్‌లైన్‌లో నమోదు చేసుకోవాలి..
Who are passed with good Points in SSC / Class 10th in March 2019 final exams they can apply for Inter admissions into first year with M.P.C, Bi.P.C, M.E.C and C.E.C groups English Medium in Model Schools for First year intermediate.1.Those who were passed SSC Public Exams in AP are eligible for applying for Inter admissions into first year with M.P.C, Bi.P.C., M.E.C and C.E.C groups in AP Model Schools. 1.Selection procedure based on SSC Grades for admission into Inter first year. 2. The selection of the students will be made through a committee formed under the chairmanship of Additional Joint Collector of the district and DEO, RIO, RMSA and one principal of Residential School as per GO.17, dt: 11.02.2013..
2. SC/ST Candidates who wanted to get admission have to pay registration fee of Rs.50/- only. Eligible Students can apply through online mode only at http://cse.ap.gov.in/DSE/ and Candidates should take print out the application form and they should submit to the concerned MEOs. OR Submission of printout of admission application form to the Principal of the Model School in which the candidate wish to join. ⇒ GO.Ms.No.22 School Edn Dept ,dt.29-04-2015. ⇒ Commissioner of School Education, AP Official Webportal. ⇒ APMS Inter admissions 2019-2020 Guidelines, Selection Procedure.